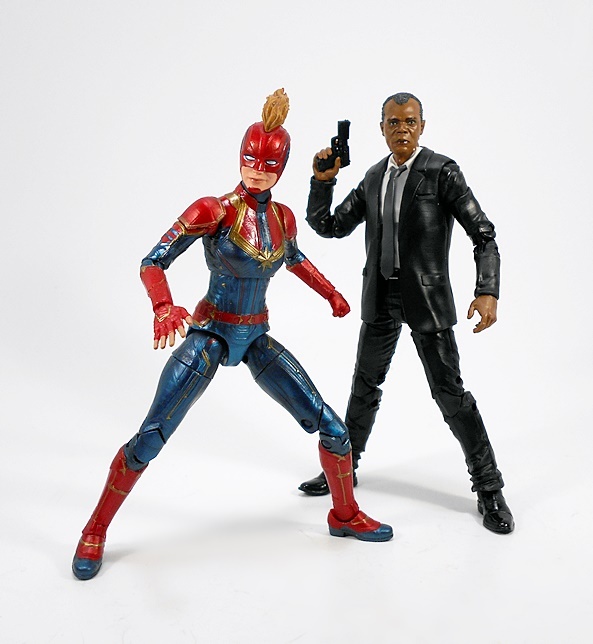 It’s the second day of me powerhousing my way through the new Captain Marvel Legends wave. And as much as I had to lead in yesterday with Carol, there was no way I could go another day without opening up young Nick Fury. But don’t get too comfy, because today’s review is going to be easy-peasy, quick and breezy! While the packaging looks the same as always, the windows are now just a clear cover on the tray. I’m not sure why they went this way, maybe it’s cheaper to make, but either way it doesn’t really effect me because I toss out these packages. 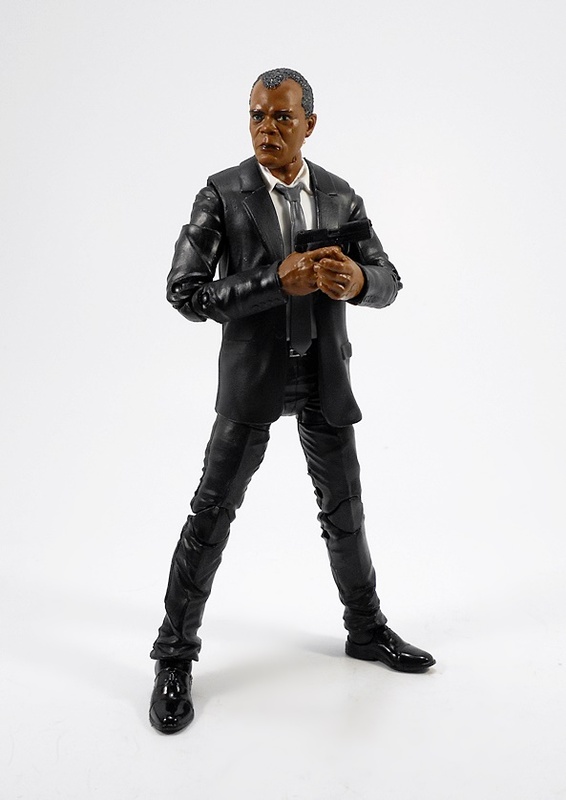 Of course, this is Nick Fury circa 1995 and I’ll note here how curious I am about how much Fury will be in the film, since Disney is working their de-aging mojo on him. Although, they seem to be pretty comfortable with the technology, so hopefully it’ll be a lot. 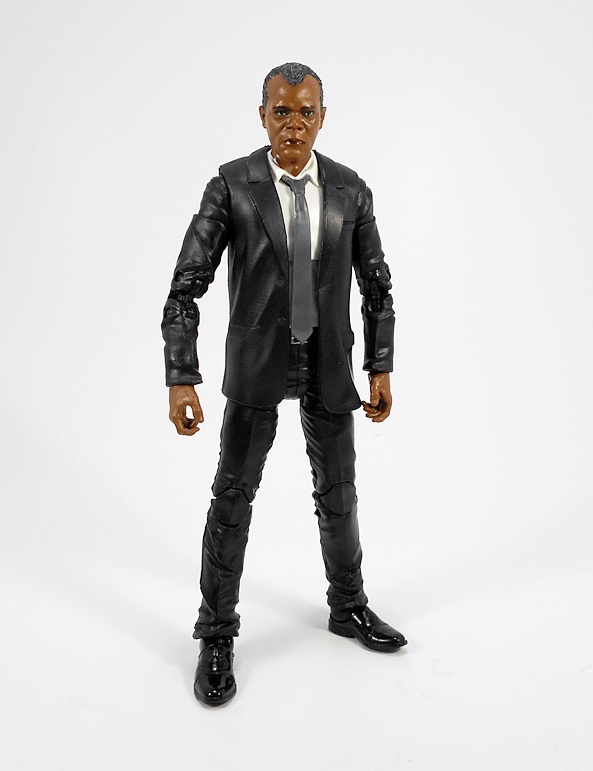 And I’m getting off easy today, because there isn’t a whole lot to say about this figure as it features a standard guy-in-a-suit buck. 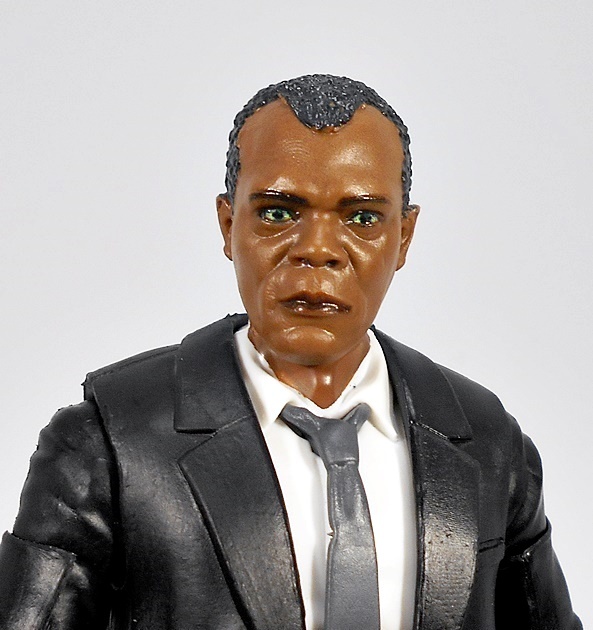 I am, however, surprised to see that Hasbro didn’t just take the buck used for Agent Coulson and slap a Sam Jackson head on it. 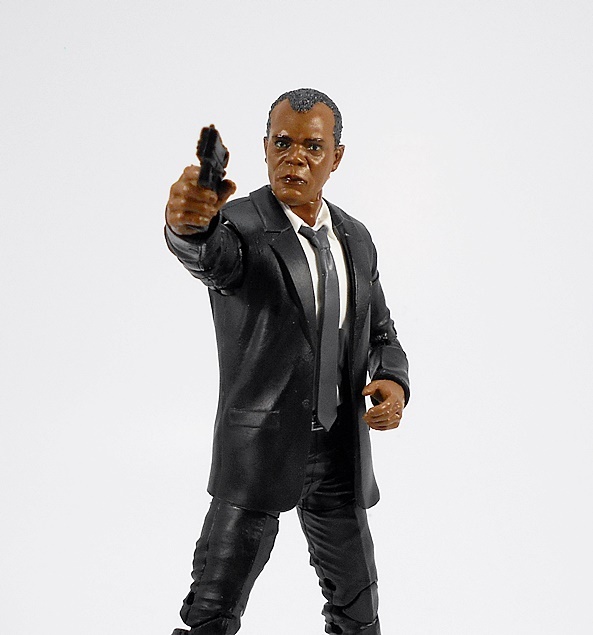 No doubt, there’s some re-use here, but this Agent Fury figure stands a good bit taller than the Coulson we got way back in that Agents of SHIELD 3-pack. Beyond that there are some notable differences, like the buttons on Fury’s coat being sculpted sharper, his collar is completely different, and his necktie is tied a bit looser. It’s not a lot to notice from a casual glance, but it’s still nice to know that Hasbro put some work into this figure. As usual, the jacket effect is achieved with a sleeveless vest cast in soft plastic and the jacket sleeves sculpted as part of the arms. 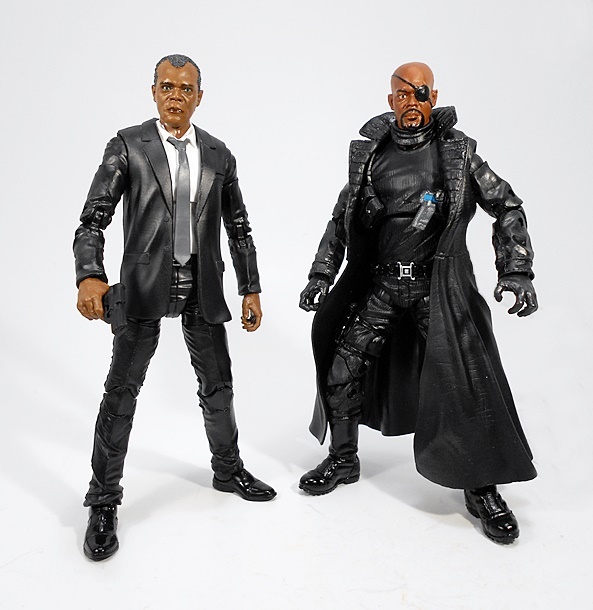 The head sculpt features a pretty good likeness to younger Sam Jackson, which depicts Nick Fury before he lost an eye. The painted details on the face seem to be actual paint and not the printed method they’ve been using lately. Either way it looks OK. My only real nitpick here is that the jointing of the neck to the head looks a bit odd when viewed from certain angles. 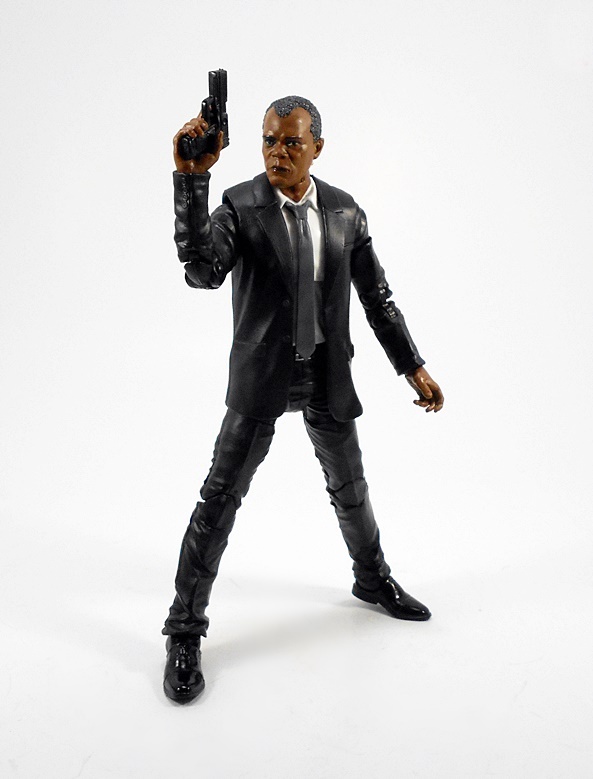 Fury comes with his trusty pistol and there’s not a lot for me to say about it. 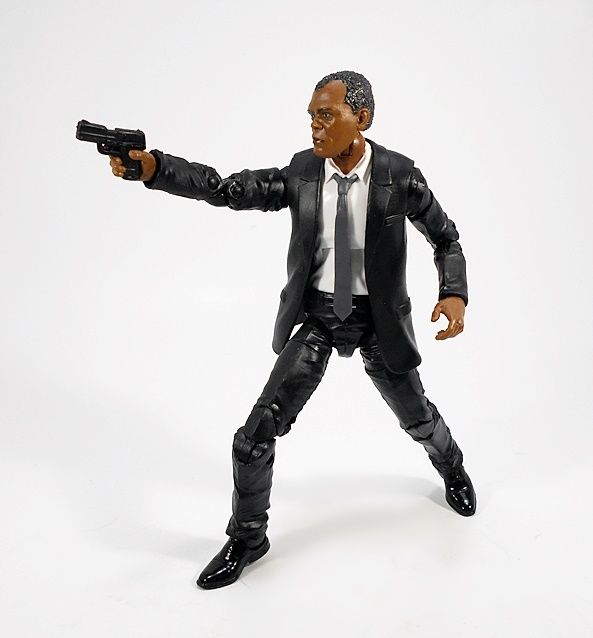 It’s cast in black plastic and his trigger finger doesn’t work so well with the trigger guard. Otherwise he holds it just fine in his right hand. 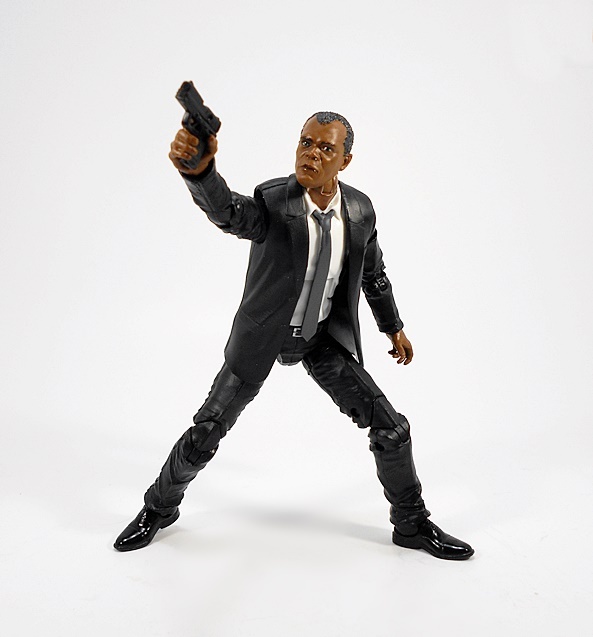 Articulation is standard stuff and actually identical to the suited-buck used for Coulson. The legs are ball jointed at the hips, have swivels at the thighs, double hinges in the knees, and both hinges and lateral rockers in the ankles. The arms have rotating hinges in the shoulders and wrists, double hinges in the elbows, and swivels in the biceps. There’s a swivel in the waist, a ball joint under the chest, and the neck is both hinged and ball jointed. 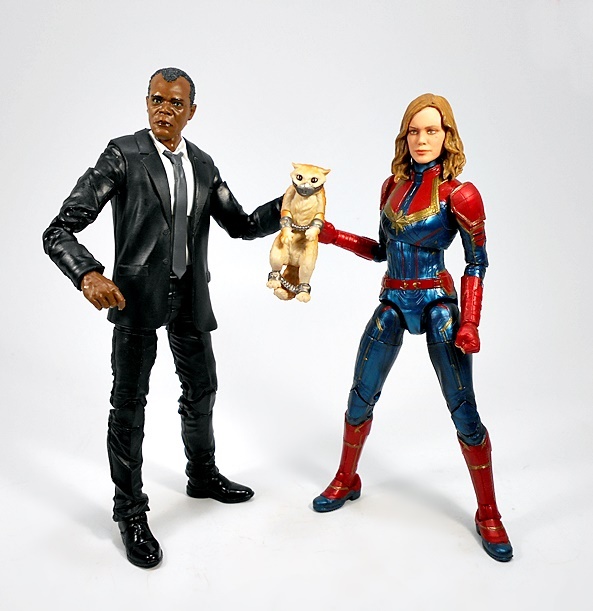 Fury also comes with one of two versions of Carol Danvers’ “cat,” Goose that are included in this wave, and I’ll defer from clarifying those quotes around the word cat to avoid any specific spoilers. Although as you can probably guess by the accessory, this isn’t your ordinary domesticated feline, because the little guy is locked up in restraints. The scruff of his neck is sculpted specifically so that Fury can hold him by it with his left hand. It kind of makes out like Fury and Goose aren’t going to get along, but seeing him playing with Goose in the trailer sets my heart at ease. And that’s all I got for today. 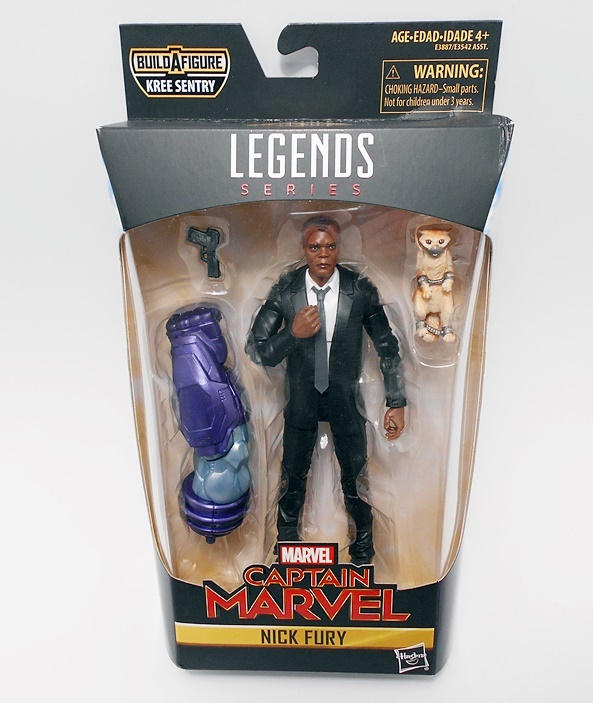 Don’t mistake my brevity as a slight on the figure, because I was really looking forward to getting him and I’m still happy to be getting young Fury from the film for my MCU Legends shelf. 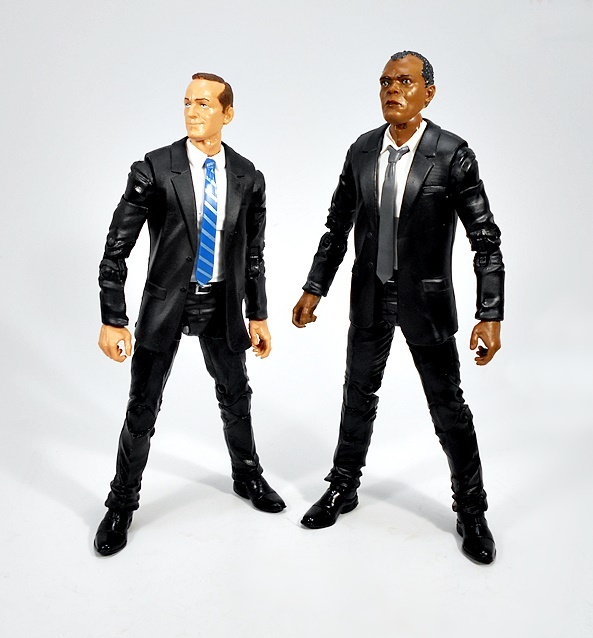 I greatly appreciate the changes to the suited-body, especially for when I’m displaying him and Coulson together. Indeed, I dig this figure so much, it makes me realize how badly we need a new regular version of MCU Fury. He would have been an excellent candidate for a do-over in The First Ten Years releases. 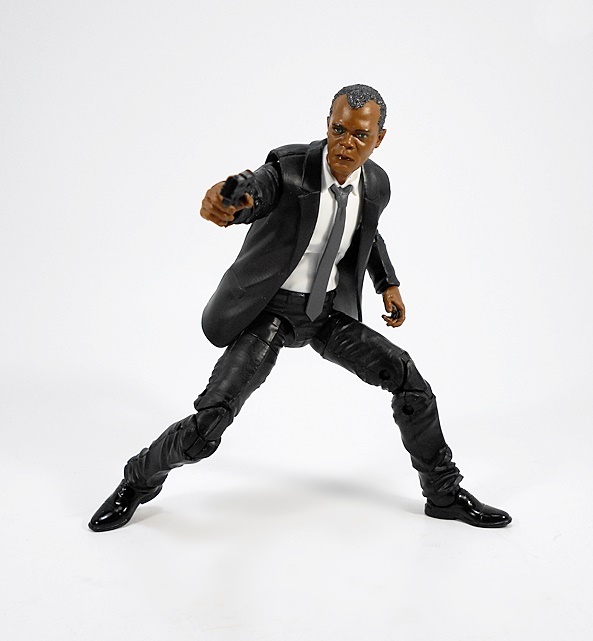 Anyway… come on back tomorrow and we’ll dig into another figure from this wave! Love the changes to the suit body. Very entertaining review, I agree about the gun, I can’t get it to fit right. Eagerly anticipating tomorrow’s review. How do you find these so quickly? Just preorder the wave? Thanks for reading! Yeah, Amazon put these up for pre-order so I was able to get them all in one shot. It was unusual, because most of the time I’m only able to get a few from Amazon and then have to hunt down the rest.